Attorney Bradford “Brad” Bernstein is a leader in the area of immigration law and among the most educated and exciting voices in his field. This “Super Lawyer®” offers expertise not only through his practice, the Law Offices of Spar & Bernstein but also as the host of The Brad Show Live, which has been assisting immigrants in the Greater New York area and around the world via digital broadcast. Along with helpful tips for those seeking residency and citizenship in the U.S., the show welcomes questions (via phone calls or Facebook comments) in real-time. “The show’s team works tirelessly to churn out compelling stories of people all over the world chasing their American Dream,” says Bernstein. It is broadcast digitally via Facebook Live daily during weekdays, at 5:30 -7:30 PM (EST). Take Antoinette Tuff, who saved hundreds of children after talking down a shooter at an Atlanta school four years ago. Since then, Antoinette has used her platform to write a book, Prepared for aPurpose, and share her unexpected journey to inspire others to find the hero within themselves. “Her message of faith and self-love left us moved to tears for nearly the entire segment,” he went on to say. Antoinette Tuff ’s inspiring true story was made into a Lifetime movie, Faith Under Fire starring Toni Braxton. On a lighter note, Jamaican-born recording artist Shaggy stopped by to discuss his journey to the American Dream. Bernstein explained how charitable the superstar was with the creation of the Shaggy Foundation and its flagship charity event, the Shaggy and Friends Music Festival, which benefits the Bustamante Hospital for Children in Kingston, Jamaica. Bernstein also remembers one of the first guests, U.S. veteran Hector Barajas, who was unjustly deported. “Eventually Hector used his experience as a springboard to start the Deported Veterans Support House for other veterans in Tijuana.” In another episode,former Real Housewife of New York, Aviva Drescher, discussed her family’s pursuit of the American Dream. It was with the incredible work she has done as the spokesperson for the One Step Ahead Foundation which provides access to prosthetic limbs for disabled children around the world. “All guests have been an incredible mix of inspiring, hilarious, and heartbreaking stories—but always compelling,” says Bernstein. The show was born 20 years ago when Bernstein started fielding questions on immigration on the radio. A good number of his listeners were those who lacked traditional access to legal assistance. Then in 2017, Bernstein decided to broadcast the show live on Facebook from his phone, and a full professional studio quickly followed. “Today, the show is exclusively digitally broadcast on Facebook Live. I’ve had the privilege of helping hundreds of thousands of listeners and viewers with their immigration issues,” says Bernstein. After graduating from the University of Michigan in 1990 with a degree in Political Science, Bernstein enrolled at Brooklyn Law School, from which he graduated with honors in 1993. He then joined his grandfather Harry Spar’s immigration law firm, with the intention of eventually striking out on his own. 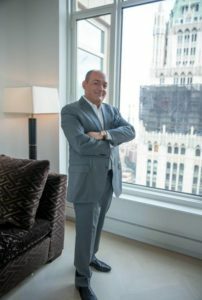 Weeks after opening his private practice, however, a family health emergency brought Bernstein back to Spar’s firm, where he soon discovered a passion for immigration law. Bernstein became a partner in 1997, and upon his grandfather’s retirement in 2000, he took over the firm’s leadership. “Now more than ever, I operate on the belief that everyone has a right to the American Dream. I’ve devoted my life to helping those whose sole wish is to provide a better future for themselves and their children. In many ways, the U.S immigration policy is confrontational by nature and often assumes the worst of people, so being a voice and a champion for the underserved immigrant communities who often don’t realize how complex this process can be is extremely fulfilling,” he explains. “Every day, I’m reminded of the lives Spar & Bernstein has changed thanks to this firm’s relentless drive to securing immigrants legal status and reuniting families that have sometimes been apart for decades.